Did you Swipe Right on Tinder and meet someone you’d like to date exclusively? If so, congratulations are in order and you’re not alone. Tinder reports 10 matches to date and 1.4 billion swipes every day. Still, we get contacted several times a week when someone thinks their boyfriend or girlfriend is cheating on them because his or her Tinder profile is still active. Typically a friend notices it and wonders if there’s trouble in paradise. Before you start accusing your S.O. that they’ve been sneaking around and before you do something drastic like sneak a peek at their phone, as a Tinder Expert, I need to share with you that there’s a huge DIFFERENCE between REMOVING Tinder off your mobile phone, which is what the majority of people do, and actually DELETING Tinder through their app while it’s still on the phone. The former will result in your profile still being active for others to see and it sends a message that you’re single and hoping someone will be swiping right in anticipation of a match and to meeting IRL. 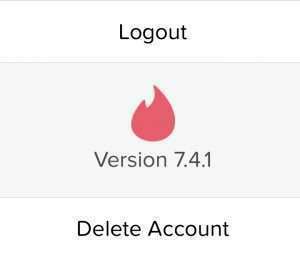 The latter disables your account and your Tinder profile will no longer be viewed by others who are swiping and matching. Got it? So here’s how to fix it. If you’ve already taken Tinder off your mobile phone, download the app again and sign in. Once your profile is on the screen, click on the grey gear symbol in the middle of the screen. This brings you to a “Settings” page. Scroll to the bottom of the page, where you will see the option to “Logout” or “Delete Account.” Select Delete Account. If you’ve met someone you really like, give it a chance to see where it goes. If you ever break up, you an always create a new Tinder account in just a few minutes. Julie Spira is America’s Top Online Dating Expert and mobile dating expert. She’s the CEO of Cyber-Dating Expert and has been helping singles find love online for over 20 years and on mobile apps like Tinder since their launch. Follow @JulieSpira on Twitter and Instagram. Find out how our Swiping Right program will help you have the most rocking Tinder profile to fill your date card.